In the late '90's I had an apartment in Galaxy Towers, Gutenberg, New Jersey, looking out on Manhattan from the 2nd highrise from the right in this picture. 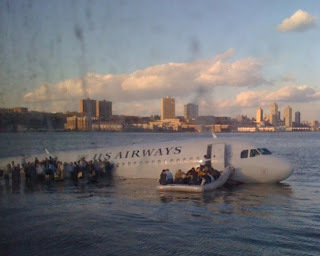 Had I been there this afternoon I might have got a great shot of US Airways flight 1549 ditching in the Hudson. Alas. 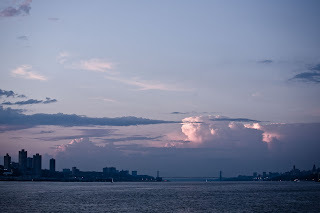 The shot below I took from a ferry like the ones at the rescue, looking north to the GW Bridge with New Jersey left and Manhattan right. Update: Imagine the stricken plane gliding down over the GW Bridge. Apparently the plane came within 600 feet of the bridge, but it was ok as the pilot, Captain Chesley B. Sullenberger III, had the presence of mind to hold his EasyPass up to the cockpit window.